"Everyone my age remembers where they were and what they were doing when they learned about the contest." 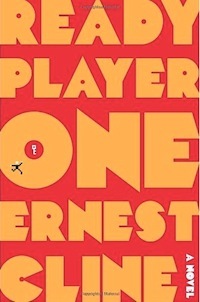 I finally got around to reading Ready Player One, by Earnest Cline, after friends told me I had to read it. A near future scifi adventure, Ready Player One imagines a world that has become so polluted, poverty-stricken and corrupt that the only escape is in the virtual world. "Oasis" is the name of a global immersive online universe that is a combination of an open ended virtual world like Second Life and a massively multiplayer online game like World of Warcraft. People lead their entire lives inside of Oasis, going to school, socializing with their friends, and holding jobs there. The story revolves around the search for an "Easter Egg" in the game of unimaginable value. One young man who lives in a trailer park dreams of finding the Egg, but he competes against millions of other players who seek it. Ready Player One is a breezy adventure tale that is a loving homage to 80s era video games and entertainment, from "Family Ties" to Zork. I grew up in that era, but still I found it hard to get into the story for the first third of the book. Cline's first novel, he writes with a blunt, didactic style, laying out the back story and character bios in a "tell don't show" manner. Still, this does help him get to the action fast, which is really the point. After the first couple of establishing chapters, the action amps up and keeps accelerating like a video game until "game over." He makes it easy to visualize the frantic search for the Easter Egg, the complicated puzzles and challenges, and the epic battles. It's not surprising that the book has already been optioned as a movie. If you liked Snow Crash, play an MMO, reside in Second Life or dig old school gaming, you will enjoy Ready Player One.